Bring customer preferences and product information to the sales floor. Sales Assist provides deeper product knowledge at a glance – including catalog, sales data and chain-wide product availability. This knowledge enables sales associates to answer customer questions and provide products and recommendations on the spot in the store. Sales associates can wow every customer, every time because of the app's deep analytics and access to customer data – along with its real-time product and location information. The app allows sales associates to deliver customized recommendations as soon as a customer walks in the store. They can access customer preferences and past purchases to offer better, more personalized service. 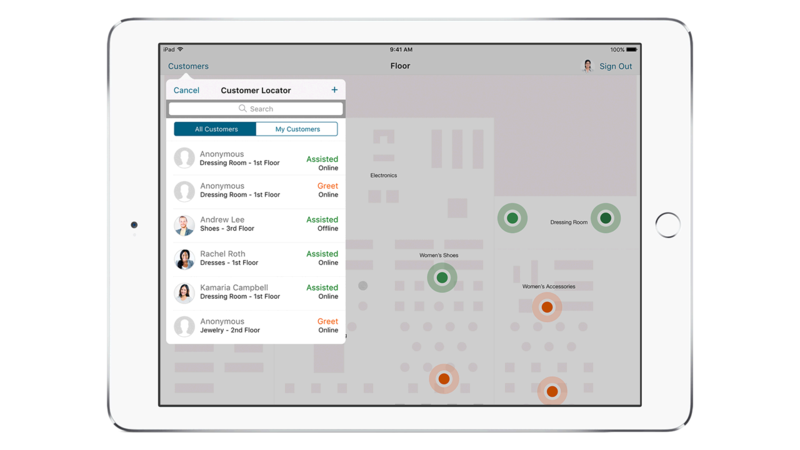 With the app, an associate can locate any product – whether in the store or elsewhere – with deep product information easily available from the iPad. The app uses iBeacon technology so a shopper’s whereabouts on the floor is easily identified and they can be found and helped quickly. Real-time analytics allows you to easily look up inventory, help provide next best actions and build a deeper relationship with every customer who enters the store. Gives perspective and data-driven recommendations on in-season buying. Ensure customer satisfaction with on-time order arrival. Make any consultant a personal shopper for any customer. Gives managers a view of schedule exceptions and coverage gaps. Make consultations quicker and easier for employee and client. Automate the scheduling process for increased workplace satisfaction. Gives managers control of connected store solutions. Enable brick-and-mortar stores to fulfill online orders faster. Give retailers the power to close a sale from anywhere in the store. Enables customers to view or purchase products and request sales help.